This post summarizes my general architecture and design guidelines for developing applications and points to some interesting NET technologies. Reading this post will not make anyone an architect, but working through it should give you a good foundation for understanding and discussing architecture and design decisions. BTW: Architects must write code to really understand what they are talking about and experience some of the pain their design decisions may cause for project managers, programmers, DBAs, operators and users (see MS WeSYP). Do not try a one-size-fits-all approach to application architecture. Resist the golden hammer syndrome: “For a small boy with a new hammer in his hand the whole world looks like a nail”. Ex: Do not use a 4-tier Java web app for everything. Architecture is: “Decisions that are hard to change later”. Non-functional requirements are the main forces driving architecture and design decisions – not(!) the functional requirements (like manage products and inventory, print invoice). Ex: I you decide to use a stateful solution and discover later that your availability and scalability requirements need network load balancing, it will be very difficult to move to a stateless solution (required for networking load balancing without sticky sessions). For how to make quality requirements measurable see Principles of Software Engineering Management, Tom Gilb. 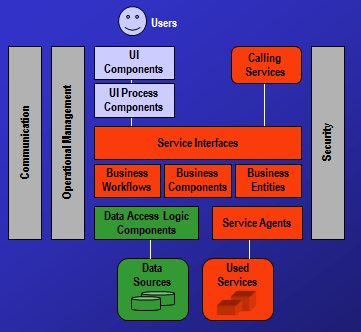 Your application may comprise different application archetypes playing together. Create a design that meets all the specific non-functional and functional requirements of your applications. With functional requirements you should avoid unquestioned anticipation of “future needs”. With non-functional requirements is a good idea to anticipate them. Because non-functional requirements mainly drive our design, we generally can begin developing our architecture while functional requirements are still incomplete and unstable. See Microsoft® Application Architecture Guide, 2nd Edition (Patterns & Practices). For applications with little or no domain logic use the Table Module pattern – regardless of the complexity or size of the application! 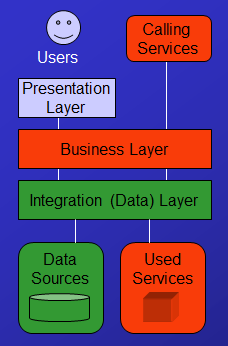 See Patterns of Enterprise Application Architecture, Martin Fowler. The Table Module pattern blends well with stateless approaches. 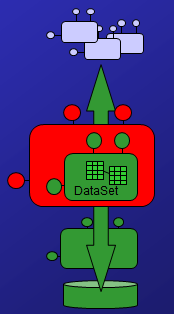 Typed DataSets are a half-baked solution. To implement a domain model approach, consider using Mobile Objects. 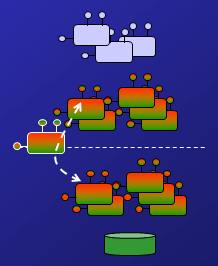 Mobile Objects are the central feature of Rockford Lhotka’s Component Scalable Logical Architecture (CSLA). See Expert C# 2008 Business Objects, Rockford Lhotka. 🙂 All validation logic in one class. UI input validation. BL validation. 😦 Code must be deployed on clients and servers. 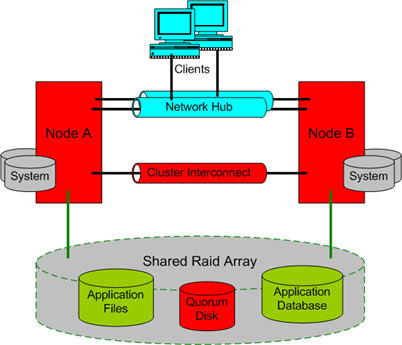 For purely data centric applications consider using a Fat Server approach doing everything in the database. For the benefits of doing things in the database see “My Approach” in Expert Oracle Database Architecture: 9i and 10g Programming Techniques and Solutions, Thomas Kyte. For a more critical view see Stored Procedures Pros & Cons. Use chunky (vs. chatty) calls! When distributing components across .NET application domains, processes, machines or in the interned (Cloud) there are many aspects to consider. Naïve OO approaches and tool vendors promise object location transparency. But performance is not location transparent! Do you need the availability or scalability it offers? Weigh the state management problem. Do you need multi-tier distribution? 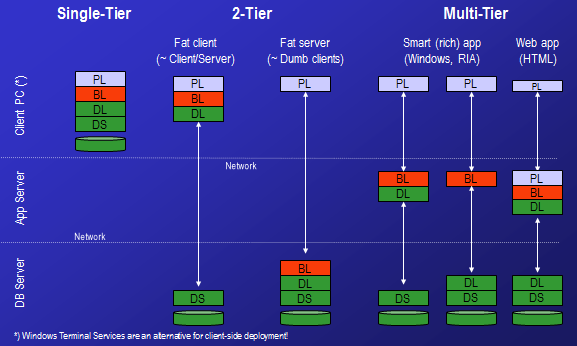 Adding tiers hurts performance and availability. Must size hardware and network to compensate. App and DB usage need different OS configurations. System management standards may enforce separation. Not(!) between web server and app server. Availability no longer is a problem. Security considerations might still be a reason to distribute. Fight for minimizing unfounded x-process communication! Very easy and productive to use. Choose between instance- and service-based collaboration. WCF supports both collaboration types. 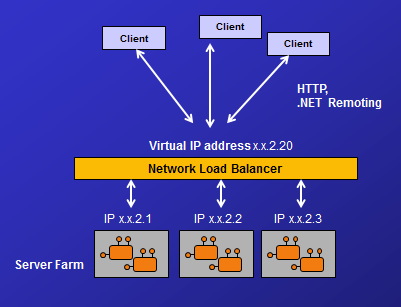 In homogenous .NET environments consider using IPC or TCP bindings for best performance. WCF provides support to enable services to be discoverable at runtime in an interoperable way using WCF Discovery. Windows Azure AppFabric Service Bus relay service. Use for near links. In a controlled environment. Use for far links. 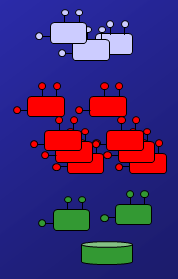 Connected system may not be within single control-span. 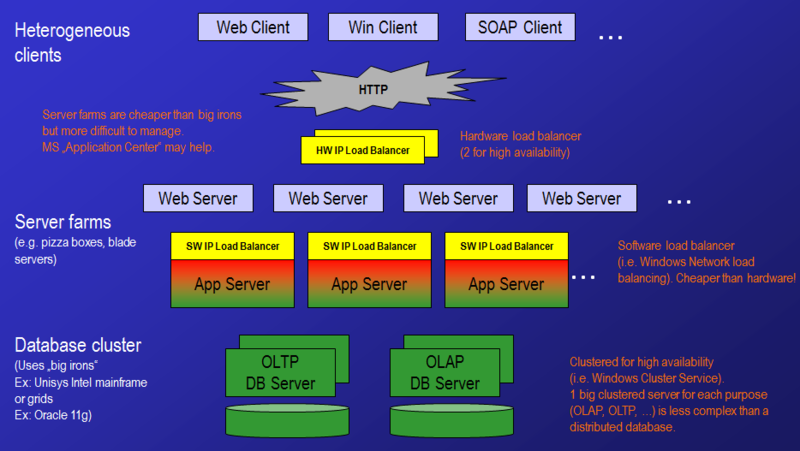 I case you want to implement web services (SOAP): prefer WCF over ASMX web services. See DB Concurrency Control with .NET. Decide how to handle session state. State: A property is part of the state of a component instance when it must retain its value between two invocations of any method. State management: Mechanism used to logically store the state of a component instance, for the duration of an interaction (session) with it. Component retains state between requests. 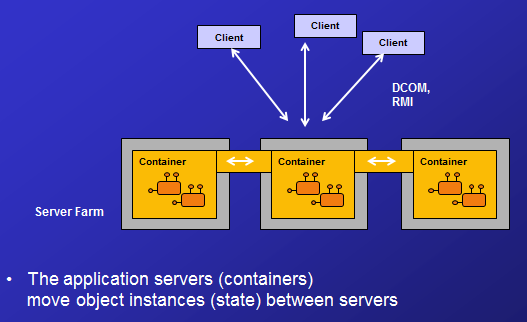 For horizontal scalability you may use the component load balancing feature of a container. Component does not retain state between requests. 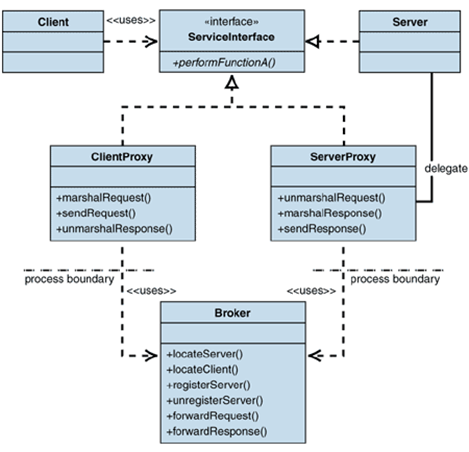 Use self-contained, service-based interfaces passing all data to fulfill request. Or use client, server, database state (see next slides). Blends nicely with network load balancing. Fit nicely with OO thinking. If horizontal scalability is not needed. Costs bandwidth with thin clients because state must be passed with every request. Hold state in server memory. Use dedicates state server against server affinity. Memory is fast but does not scale well. Consider using parallel programming to increase the responsiveness of an application and to make use of multi-core and many-core machines. App produces files of shared data for other apps to consume. Apps store data they wish to share in a common database. App exposes some of its procedures so that they can be invoked remotely. Other apps invoke those to run behavior and exchange data. Apps connect to a common messaging system, exchanging data and invoking behavior using messages. 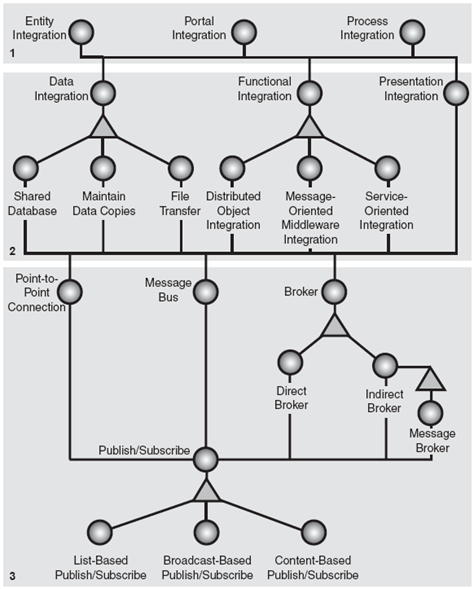 See Enterprise Integration Patterns, Gregor Hohpe. Have a look at Windows Azure AppFabric Service Bus relay service. Keep it simple and lean! Good Solutions strike a balance between the size of the problem they solve and the effort to implement them. you will throw one away anyway. See The Secrets of Consulting, Gerald Weinberg. Create it early, test it, develop with it. Prototype and performance test early! 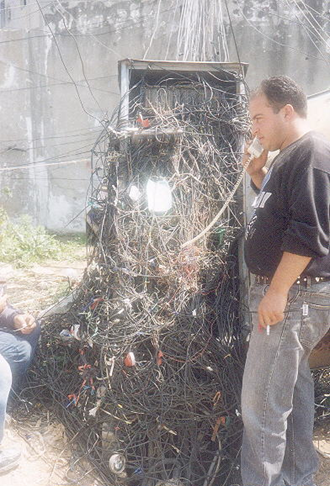 (client load, database size, topology). Never forget the (potential) wire! Cross-machine or low-bandwidth, high-latency connections I mean. Only distribute vertically (x-Process, x-Machine) or horizontally (for load-balancing or availability) if you really have too. 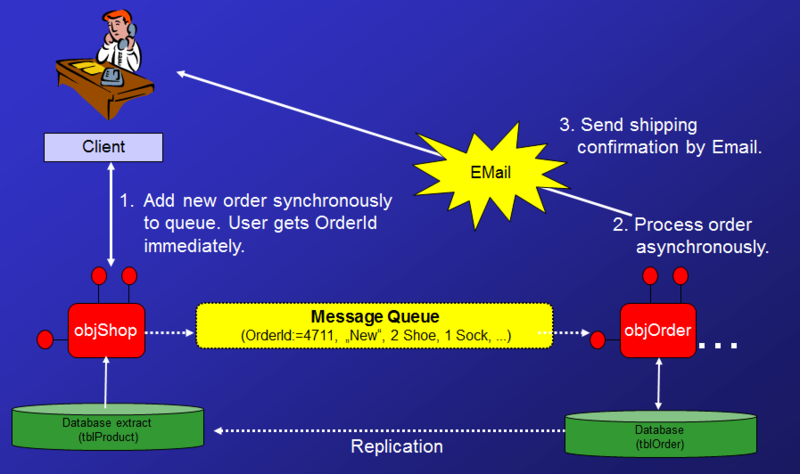 Consider using asynchronous calls or messaging. 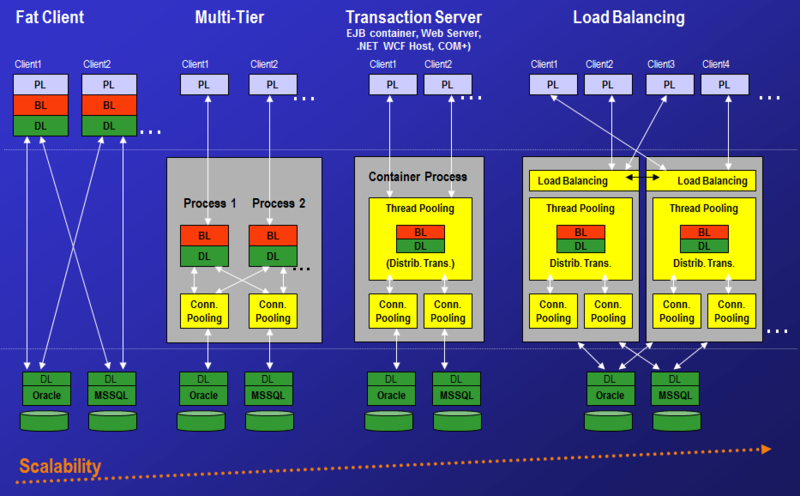 Prototype and performance test early using a (simulated) production environment(client load, database size, topology). Consciously decide if using plain ADO.NET or an O/RM. See .NET Database Access Options. Beware of using or developing custom frameworks! Stick with frameworks the are readily available out-of-the-box or as open source and invest your time and energy in providing a benefit to end users. Do not create your own frameworks like MVVM, O/R mappers, etc. Your colleagues will thank you for not leaving smart, half-baked frameworks behind for them to maintain and your customers will be glad to avoid a software house lock-in. Do define strict standards for application interoperability. Ex: require all applications to offer their data or functionality via secured (web) services or OData feeds. Reuse by delegation (Ex: using web service) works. Reuse by sharing code or components generally does not work. Mega (company) data models or repositories generally fail. Choosing platforms like Java or .NET, development environments or database systems is an implementation decisions. While recommendations are fine, please do not try to enforce strict standards here. Leave these decisions to the project teams. Unrealistic standardization only gets bypassed and over the time you loose control over your application landscape. Offer an easy route for controlled rapid application development by and for your business users (ex: actively support LightSwitch). This entry was posted in Computers and Internet and tagged .NET, ADO.NET, Architecture, Database, Distributed_Apps, Entity_Framework, LightSwitch, Oracle, SQL_Server. Bookmark the permalink. well explained but I am quit confused yet .where to put what ?, I mean if I m using dependency resolver,repository,entity, abstract factory,interfaces,helpers, utility etc. however I can use BLL for business logic and DLL for database handling. please suggest if I use n tier web application ,how to manage it. Don’t try to make use of each and every pattern you can think of. Keep your solution simple! Dependency injection is a powerful and helpful pattern: If you don’t have solid experience only use it if the complexity of your solution really requires it. Repository, entities, …: Just use a standard O/R mapper of your dev platform, ex: the .NET Entity Framework. Abstract factory, interfaces: These are just coding patterns you can use when helpful. Try coding a part of your solution with and without them to get a feeling for the pros and cons. Helpers, utilities: Just create what you need. If your solution is not distributed across machines (like with a simple web application) you don’t even need to encapsulate them in a separate DLL. If the non-functional requirements of your application ask for a simple web application there might be no need to create separate business and data layers. Just write your business logic and access the database directly via the O/R Mapper.